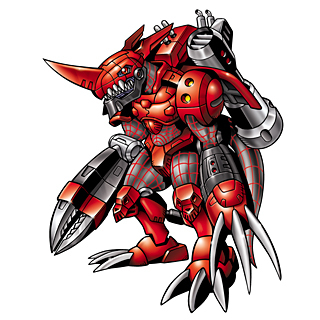 It is said that Mugendramon, who was built by combining the parts of many Cyborg-species Digimon, demonstrated abilities beyond imagination, and that the experiment succeeded. 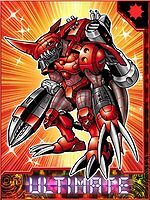 Adding enhancements to further improve that Mugendramon made it Chaosdramon, who possesses a deep crimson Metal Body. Its body, which is made of "Red Digizoid" that was repurified from the virtual super-metal Chrome Digizoid and increased just its hardness, deflects every attack, and destroys everything. Also, the version of the program that was set in its Digicore automatically performs improvements to make it even more destructive. 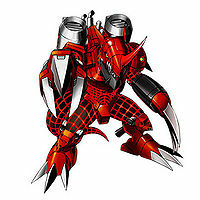 Chaosdramon is also the Digimon that the leader of the Crack Team primarily employs as its agent. Its Special Move is a superdreadnought-class energy wave fired from its two artillery cannons (Hyper Mugen Cannon). 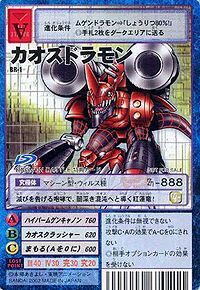 Title: 「深紅の鋼鉄竜」 — "Crimson Steel Dragon"
Hyper Mugen Cannon  Hyper Infinity Cannon ハイパームゲンキャノン Haipā Mugen Kyanon Hyper Attack/Hyper Infinity Cannon Unleashes two insanely powerful beams of energy from its cannons, using power straight from the Dark Area. Attacks with the claws and blades of both hands. Shoots an organic missile from its right hand, which injects a lethal virus on its victim. 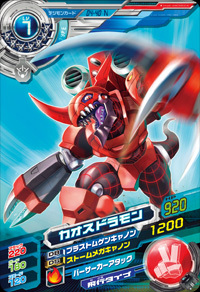 Chaosdramon is one of the three commanders working for Barbamon. 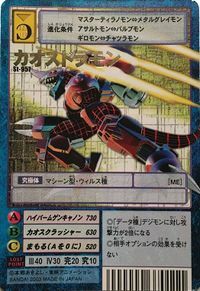 Barbamon claims to have created it from the Dark Area's data, with intentions of creating the "ultimate killing machine". The first Chaosdramon, Chaos Lord is a powerful opponent. 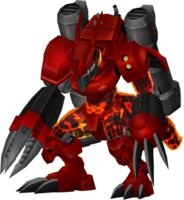 Chaosdramon is an available Burst Mode Evolution for Mugendramon. It can be unlocked if level 65 or above with the item Hyper Cannon. 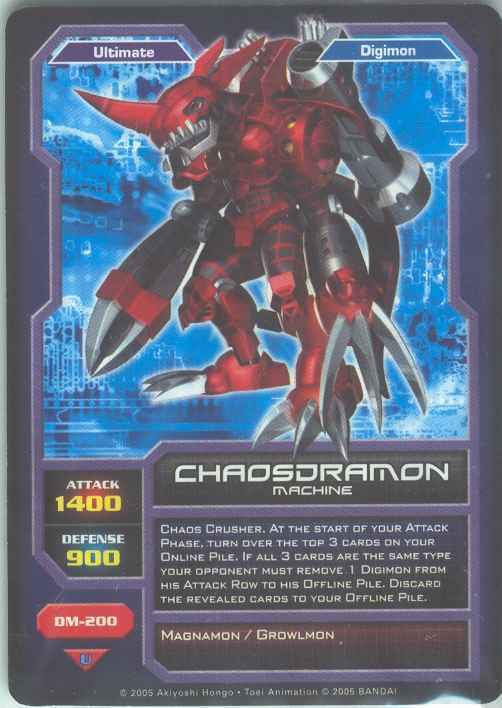 Chaosdramon can only be obtained as a collectible card. 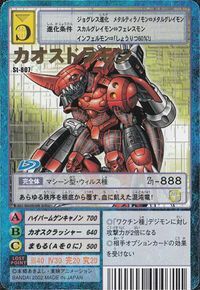 Its card is part of the Crack Team (クラックチーム Kurakku Chīmu) set. Chaosdramon is available as a Digimon Medal. 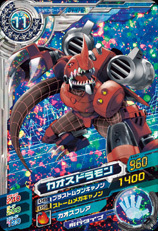 Chaosdramon is available as a Digimon Card. 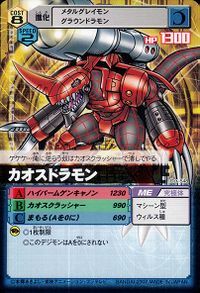 Evolves from Aero V-dramon, Megadramon, Megalo Growmon, Metal Greymon, Metal Tyranomon, or Paildramon. It undermines all order at its root, the bloodthirsty Chaos Dragon! This crimson dragon's roar proclaims ruin and leads all to the dark depths of chaos! Hehehe...all who oppose me shall be annihilated by my Chaos Crusher! 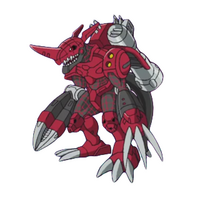 A Digimon that was modified and upgraded from Mugendramon. 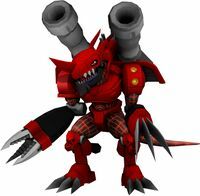 It can fire powerful energy waves from the gigantic cannons on its back. 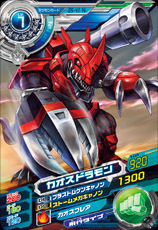 It strengthened its body with "Red Digizoid", a material even harder than "Chrome Digizoid". 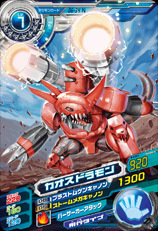 A Machine Digimon with powerful cannons mounted on its back. It is a being that throws all order into chaos. 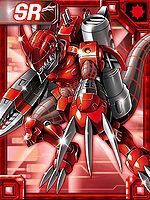 A mechanical dragon whose defining characteristic is its red body, which boasts great defensive capabilities. It was brought about to destroy everything and throw the world into chaos. ↑ Digimon Fusion: "When Worlds Collide"
↑ Digimon Next: "System World!" This page was last modified on 11 March 2019, at 04:32.